“Diversity” is the word that I would use to describe Burn Halo, the self-titled debut album fronted by former Eighteen Visions singer James Hart, released on March 10 through Rawkhead Records. The wide variety of hard rock songs on this LP makes this one of the must-have records of 2009. I remember when I first heard Appetite For Destruction back in the winter of 1986 and thought to myself “Wow, these guys have one cool song after another” Since that time, few band have impressed me in such a way. Burn Halo’s new album has made my list of the few, elite bands to thoroughly impress me from beginning to end without becoming redundant halfway through the record. The true test for me, however, was to see them live. I recently saw them as one of the opening bands for Papa Roach, Buck Cherry and Avenged Sevenfold and found them to sound just as phenomenal as many veteran bands. Just as they do live, this album proves to deliver a cumulative assortment of tunes from heavy to ballad that seems to derive its energy and style from the last twenty years of 80’s, 90’s and new millennium music. “Dirty Little Girl” is the album’s first single, and is gaining momentum as a popular radio song across the U.S. and it features Avenged Sevenfold’s Synyster Gates on guitar. The song “Save Me,” which happens to be one of my personal favorites on the LP is another one that I’m sure will be soon to follow. 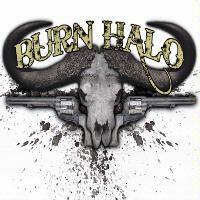 In addition to James Hart, Burn Halo consists of Aaron Boheler on bass, Joey Cunha on lead guitar, Allen Wheeler on rhythm guitar, and Ryan Folden on drums. Why not start out with the most rocking tune on the whole album? You have only one chance to make that first good impression, and this is it. This is the all-guns-a-blazin’ song that has one of the most powerful riffs that I’ve heard in a long time. There is a heavy vibe here that has the potential to make this song a timeless masterpiece. There is a grinding guitar crunch with the main riff that is combined with something melodic that sets it aside from the rest of the songs on the album. The continuing rhythm and bass guitars really help to carry the song very fluidly from beginning to end. In my recent research of Burn Halo on various websites, I’ve read that they have somewhat of a throwback to certain eighties music, and now I see why. There is definitely a mainstream style not only with the music itself, but the vocals as well. This also marks the diversity of James Hart as a cultured musician who isn’t afraid to step outside of the box. This is also the song that should become a popular radio hit because of the fact that the chorus has such catchy lyrics that make you want to sing along with them. Once again, we get another number that breaks the mold of the one before it. Acoustic guitar is introduced as the driving rhythmic force. What I appreciate the most is that it is mixed in with the electric guitar as a supplement, making it even more majestic as the two intertwine together. This one seems to virtually stand alone on vocals. Although the guitar riffs and drums hold it together musically, Hart demonstrates that you can use several different vocal styles between the verse and main chorus. There is also a nice change here where mixing effects are used to compliment these different styles. This is probably one of my favorites from the album, and for good reason, because in simplest terms, this song rocks. It seems to get away from the usual sequence of how most songs go where a verse, chorus and guitar solo are the main components. Although these elements are included in this, it seems to be more like a story of mystical qualities. Perhaps the title of the song lends itself to this, but the arrangement has certain start and stop points that break it up very effectively. There is a message here. The title of the cut sets the pace for what is a tale of woe from the point of view of the hopeless romantic. Although it seems like the typical love song, the meaning is effectively communicated. The guitars are what help to keep it alive, because without them, this would become a little too boring towards the end. This one has a very cool opening riff, which is complimented by Hart at his finest lyrically. It is the piece where the band demonstrate their full capabilities as a whole. Joey Cunha shows us once again why he is the king of six strings as this one comes to a close. This is probably my least favorite track on the disc. I think that it is because we’ve already gone through two ballad-style songs already. However, I do like the acoustic guitar being used again, as it isn’t typically used by most hard rock acts today. The vocals in the chorus are a nice addition, as they have a certain power to them that seems to contrast the softer overtones. Sometimes it’s nice to have a song that you don’t have to put a lot of thought into. The short, choppy riffs in the verses really help to reinforce this. The drums and guitar solo also come alive towards the end, where the chorus changes slightly and leads us into a triumphant ending. Once again the acoustic guitar makes an appearance. Although the song itself is kind of sappy, the guitar riffs border on the edge of a classical style, which creates an exciting auditory aesthetic. The solo really helps to reinforce this, of course. I guess you could slow dance with your girlfriend to it by any means. This is a song where I start out not liking it, because the verses seem too typical, where there doesn’t seem to be much creativity in the lyrics. However, the chorus, bridge and solo parts help to save the song musically, especially towards the end. James Hart and Joey Cunha combine together themselves to finish it in an “unplugged” style that carries the song to its pinnacle, in my opinion.